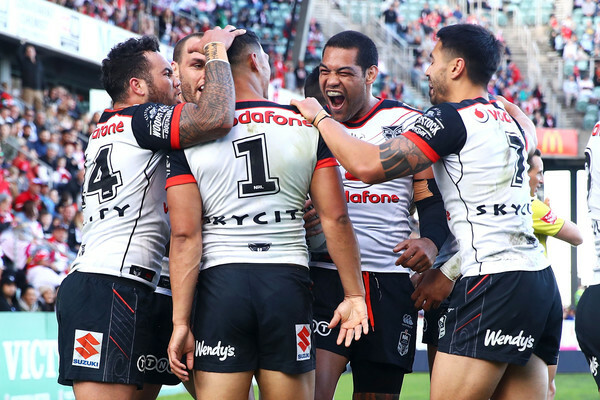 From the moment they hit the field at WIN Stadium on Saturday afternoon it was clear that the Warriors were determined to make up for their humiliating loss to the Titans the week before. They’d only come away with a victory once before at WIN Stadium, against the Steelers in 1996, but that didn’t prevent them acting like they were the home team, controlling the field and applying more and more pressure over the first stanza until they scored three tries in quick succession in the last ten minutes. The game started with a statement of purpose from Roger Tuivasa-Sheck, who notched up the afternoon’s first linebreak out of a scrum, breaking out of a tackle from Euan Aitken and then shrugging off Ben Hunt to get halfway up the field before any of the St. George players could stop him. It was a pretty dispiriting start for Aitken after being disposed of so casually by Latrell Mitchell the week before, while it didn’t help that Paul Vaughan was taken off with an ankle injury a couple of minutes later. Still, the Warriors were unable to build a try out of all that momentum. The closest they came was a linkup between Solomone Kata and Ken Maumalo, but a double pump from Kata cost Maumalo his chance, turning what should have been a try assist into a forward pass. Moments later, Matt Dufty shot across a beautiful cut-out ball to Jordan Pereira, who was unmarked on the wing, only for New Zealand to jam in and prevent what initially looked to be a certain try. While a high tackle from Gerard Beale may have returned the ball to the Dragons, the Warriors made an even biggest statement on the next set, when a massive hit from Beale himself on Gareth Widdop sent a pass to Hunt off course, getting New Zealand back down the other end again. Once there, they scored the first two points of the afternoon after Tariq Sims was called offside, forcing St. George to start again. There were undoubtedly a few highights for the hosts over the next twenty minutes, including a brilliant take under the high ball from Jordan Pereira, but New Zealand got the first try, thanks to a deft grubber from RTS that produced one of the most complex constellations of players we’ve seen in weeks. In slow motion, you could see that Aitken had tried, and failed, to swing the Steeden into touch, and that Dufty had then got the ball down a millisecond before Simon Mannering got to it. Unfortunately for the Dragons, you could also see that Dufty had obstructed RTS on his way to the football, resulting in him being stamped with a professional foul and sent off for what would become the most damaging sin bin of the 2018 NRL season. The Warriors scored immediately after, with Shaun Johnson setting the platform by running the football up to the left corner, and Isaah Papali’i sending Solomone Kata over with a one-armed offload a tackle later. With James Graham now sent off for an HIA, and Jeremy Latimore subbing on in his place, the Dragons front row was faced with an utter onslaught, so it wasn’t all that surprising when the Warriors scored again four minutes later. If Papali’i’s one-armed offload had been spectacular, then Jazz Tevega’s was unbelievable, as he collected the Steeden from Isaac Luke and then found himself faced with Latimore, McInnes, Ah Mau and Leilua, none of whom was quite able to prevent him ducking to the bottom of the tackle and sending the footy back to Luke before he hit the ground. So unlikely had it seemed that the play would continue from here that there was nobody to clean up Luke as he slammed beneath the posts, leaving the four Dragons defenders behind him to rue why not a single one of them had made an effort to properly contain the football. All of a sudden the scoreline was 12-0 once Johnson had added the extras, and just when the Dragons could have used a try, four minutes before half time, RTS popped the ball out of Tim Lafai’s hands as he was grounding it. A few minutes later, RTS went from trysaver to setting the platform for another Warriors try, feeding Luke a quick play-the-ball that allowed the ex-Rabbitoh to get the footy across to Green before the Dragons defensive line could fully compose itself. A quick cut-out pass was all it took for Green to send Kata over in the corner for a double, a mere matter of seconds before Dufty returned to the field, in what had been one of the most damaging ten minute absences of the year. To add insult to injury, Aitken was once again the casualty, finding himself steamrolled by Kata much as he had been steamrolled by Mitchell the week before, making for about as demoralizing a walk back to the sheds as could be imagined for the Red V, especially for a home fixture. The second half couldn’t come quick enough, then, for the Dragons, who effectively had to run out as if this was a different game, so drastically had things gone south for them over the opening forty. Amazingly, they managed to do just that, with the return of Graham setting the scene for a pair of tries that were every bit as rapid-fire as the first two put down by New Zealand. Both of them were facilitated by an error from Fusitua, the first of which came under a spiraling Ben Hunt bomb that had danger written all over it. A couple of tackles later, McInnes put his head up out of dummy half, saw that Papali’i and Afoa weren’t square, and plunged through for the decisive try the Dragons needed. Shortly after, Fusitua coughed up the football on the first tackle, gifting St. George a further burst of momentum that saw Dufty put in a skittering, skidding run in which he tried to nose his way through every possible chink in the New Zealand armour. While he might have slipped at the very end, he’d turned the Warriors inside out, leaving them sufficiently disheveled for Widdop to thread the needle with an elegant grubber as Luciano Leilua slammed forward and got it to ground. With Widdop managing a difficult sideline conversion with trademark grace, the Dragons were now only a converted try behind. Conversely, the Warriors had lost all the momentum they’d accrued in the last ten minutes of the first stanza, and looked as different from their former selves as the Dragons did. For a moment, it looked as if Aitken had set up Jason Nightingale to level the score, only for the Warriors’ left edge to jam in and prevent it, albeit giving away a penalty for being offside in the process. Two tackles later, Graham almost made it to the ground, and two tackles later again Sims came down just short of he line. Everything was coming together, and for a moment it looked as if the Dragons had achieved the impossible when Lafai flicked out an offload at the very moment at which the Warriors had seemed to clean him up – so close to the tackle, indeed, that it was about as close to the nexus between a regular pass and an offload as you’re ever likely to see. Unfortunately, the spin of the ball propelled it forward by the time that Pereira had grounded it in the corner, in what would have been one of the most original tries of the Dragons’ season if they’d managed to pull it off. Still, it was enough to put the Warriors in panic mode, as Johnson barked out a series of frantic orders to the rest of his mates and the Red V amped up their defence for a series of big hits to start off the next set of six. The Dragons got their fair share of chances over the next twenty minutes, most notably when Widdop cleaned up a dangerous New Zealand and charged up the field. At the other end, a late tackle from Green on Hunt got the Red V a fresh set of six on the final tackle, and on the next set Aitken busted through a tackle and almost made it to the line, only for the play to shift back towards the centre where Widdop lost the footy on the last. A huge run from Leilua in the last ten minutes also seemed like a fair option, especially when an error in the play the ball from Kurt Mann was actually ruled an interference from Leivaha Pulu. With Maumalo getting back into the field of play after regathering the Steeden, and New Zealand getting a penalty almost immediately, the Warriors had started to rebuild a little of the momentum they’d showcased at the end of the first stanza. Still, the Dragons got two more chances. At the end of their last set, a spiraling bomb from Hunt was placed perfectly to split the New Zealand defence, only for RTS to show some level thinking and allow Fusitua to clean it up. Similarly, while Green may have booted the ball into touch for the last Warriors play, the Red V still had two seconds on the clock for a scrum option, only for Adam Blair to shut down Nightingale the moment the ball left the huddle. All in all, then, this was a bit of an unusual game in terms of rhythm, with all the major pointscoring clustered around the half time break. While the Warriors will be glad to come away with the win, this was by no means an emphatic victory, especially since all three of their tries took place against a twelve man team. On the other side of the Steeden, this was a bit of a scrappy home effort from the Dragons, and they’ll be looking to recover from a bad couple of weeks when they take on the Eels at ANZ next week.